From the brewers’ town of Watou, Belgium comes a witbier made by Brouwerij St. Bernardus. The Wit looks much like cider with very hazy straw color. The bone-white head is somewhat thin. The aroma is light but complex. A spicy wheat berry character is supported by citrus, perhaps grapefruit. Bread and cloves round out the nose. The flavor is likewise spicy, featuring cloves and black pepper. A serious acidic citrus flavor follows with orange, grapefruit, and maybe even lime. Some white bread flavor, and yet more spiciness. The palate is strongly effervescent, with just enough body to keep it from being sharp. From Br. St. Bernard in the brewer’s town of Watou, Belgium I have a bottle of Watou Tripel. I am not exactly sure the difference between this and the St. Bernardus Tripel, but my impression is that this one is just a little milder. I hope they don’t complain that I’m serving it in a glass from another Watou brewery. The Tripel pours a very hazy orange-tinted golden. It is quite active, and the bubbles push around some unpleasant-looking chunks. While the bubbles on bottom are a little large, the top of the head is quite pillowy and creamy. On the nose are notes of alcohol, some sharp fruity esters, a bit of banana and clove, and some black pepper. There is a hint of sweetness. The taste is somewhat off-putting: a bit medicinal, with some sweetness, some banana, and strong alcohol. The alcohol comes off both as a peppery warming of ethanol (the good stuff) as well as strong characteristics of fusel alcohols, the longer chains of carbon that lead to hangovers. The sharp, solventy, slightly fruity flavor puts you off for a reason. It’s dangerous to drink too much. The palate is quite creamy, a bit sweet, bordering on cloying. I am relatively unimpressed by this selection. I have been very slow with this beer series. Apologies. 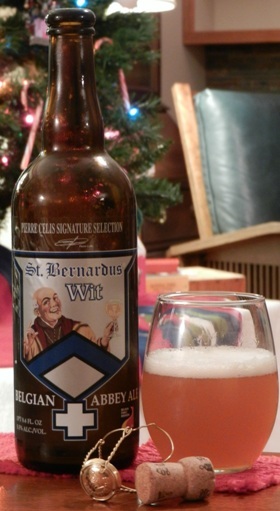 From St. Bernardus in the brewing city of Watou comes the strong St. Bernardus Christmas Ale. St. Bernardus basically invented the modern Belgian “abbey” beer when in 1946 they took over the commercial production of the beers of abbey St. Sixtus. That is the monastery that produces Westvleteren Trappist ales, what many consider to be the finest beer in the world. Since that time beer brewed inside the walls of the monastery is available only to those who visit the brewery in person (or submit themselves to grey-market thuggery). St. Bernardus got the recipes and the moxy and ran with it, becoming a wildly successful commercial brewery. Until 1992 they were even selling it under the name Sixtus. They have quite a legacy: it is interesting to see today the wide variety of Belgian beer claiming association with this or that abbey that hadn’t existed for centuries before the brewery began, cashing in on the whole Belgian beer thing. The Christmas Ale is very hazy and a deep dark mahogany, almost chocolate. The head is creamy and sticky, a pillow of wheat. The aroma is light and fruity but also noticeably cidery. A note of perry aroma as well. A bit of brown malt and a light alcohol tinge come through as well. The flavor is strongly alcoholic – present but not sharp or overpowering. There is an exotic fruit flavor of passion fruit and papaya. A mild cider flavor and dustiness intrigue me. There is just a hint of residual sweetness. After the fourth sip or so I start to detect an oak flavor. There is some character that is just not right: it is all interesting but some fusel alcohol is really turning me off. The palate is creamy and full, perhaps just a little too lingering. But you’ve gotta hand it to Belgian brewers; for a 10% beer this is really very smooth.